If you’ve been in a Tesco store this week, you can’t help but have noticed the publicity for their new petrol discount scheme, Fuel Save. Whilst you can’t earn Clubcard points with Fuel Save, it does have an interesting place in your Clubcard armoury as I will show below. For every £50 you spend at Tesco before July 2015, you will receive a 2p Fuel Save ‘credit’. This will show on your receipt. The £50 can be built up over a number of transactions. You do not need to spend it all at once. The credit you build up can be redeemed on your next visit to a Tesco petrol station. You have the rest of the current month and all of the following month to use your credit before it expires. This mean, if I spend £300 in Tesco today, I will build up (£300 / £50 =) 6 x 2p = 12p of Fuel Save credits. I have the rest of March and all of April to make one visit to a Tesco garage. Logically, you want to buy as much petrol as possible during this visit in order to maximise, in my example, a 12p per litre saving. The maximum saving per transaction is 20p per litre. Here’s the clever bit …. I have written before about how to buy £25 3V ‘virtual Visa’ cards and redeem them to pay your regular bills. You earn 150 Clubcard points for every £50 spent on 3V cards. Fuel Save is an extra bargain on top! 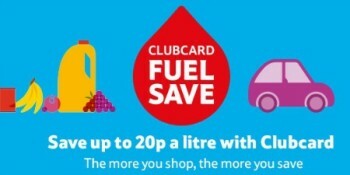 From now on, you will be getting 2p off a litre of fuel as well as 150 Clubcard points for every £50 of gift cards you buy. You can scale this up to a maximum of £500 of gift cards per month which would trigger the maximum Fuel Save discount of 20p per litre – a substantial saving if you have a large tank.